Color Confidence, Europe’s leading supplier to the photography market, are hosting a Digital Imaging Workshop to teach both amateur and professional photographers how to get accurate colour from digital images. The event will take place at The REP in Birmingham on Wednesday 19 November and can be customised to suit a variety of needs. The day comprises of a free morning session, with the option to book onto an interactive afternoon of activities and seminars (for a nominal charge of £10, which includes lunch and refreshments). There will also be a trade and exhibition area open throughout the day where attendees can take advantage of exclusive offers and promotions from some of the world’s leading manufacturers, including NEC, X-Rite, DxO, EIZO, Macphun Software, Epson, Manfrotto and Tecco. The morning session offers a seminar from Richard Curtis, Principal Solutions Consultant at Adobe, followed by insight into Andy Kruzcek’s approach to Fashion and Beauty photography. There will also be an exclusive preview of the latest imaging software from DxO. The afternoon has three specific activities, with attendees having the option to choose two of the three sessions that best meet their needs. Activities include a Photowalk with professional photographer Andy Kruzcek and an Adobe workflow seminar with Richard Curtis. These intimate sessions will have a maximum of 15 people per group and allow attendees to gain greater insight into the guest speakers. Alternatively, guests have the option to book specialist 1-2-1 training with vendors that will be exhibiting at the event. The technical specialists will be available all day to answer any questions or queries. All attendees to the Digital Imaging Workshop will get automatic entry into a prize draw to win a brand new NEC monitor. The winner will be announced on the day. For more information about Color Confidence, visit: www.colorconfidence.com. To register a place at the event, visit: diw.colorconfidence.com. This entry was posted in Color Confidence, Color Confidence Range, Colour Management, Monitor Calibration, Training, X-Rite on October 9, 2014 by Color Confidence. Our next selection of blog entries investigates all things image editing with Nik Software plug-in, with a detailed look at each plug in, and how it could benefit you. Why Nik Software, and who are they? Adobe Photoshop, Aperture and Lightroom; arguably the cornerstones of image editing that enable you to apply sophisticated and highly complex techniques. To some extent, to fully benefit from professional control and results can take months, or even years of regular uses. This can mean you develop the skills of a professional Photoshop user, rather than that of a professional photographer! However, without good knowledge of these systems, you may not be able to achieve what you want to. This is where the Nik Software range of plug-ins becomes invaluable. Nik provide a range of plug-ins that allow the user to apply filters and effects to images in a far more intuitive way than other applications. What could be a time-consuming and complex task in Photoshop becomes more straight-forward using a Nik plug-in. These plug-ins also include techniques which can’t be done through Photoshop, Lightroom or Aperture alone – extending the capability of your main photo-editing application. The Nik collections is made up of 6 plug-ins – you can either get individually, or as a full collection – which together form a logical photographic workflow. They all share an interface with the same look and feel. They work by creating a separate layer in Photoshop or copy in Lightroom and Aperture, so the original image always remains. Nik use a feature called ‘Upoint Technology’. Basically, this allows you to adjust and edit your images using control points which are selectively placed on your image. Multiple control points can be placed on the image to enable the range of effects or filters to be increased, or decreased based on your requirements. So, that’s how they work, now let’s have a look at each Plug-in to see what they do… This week we look at Dfine 2.0 and Viveza 2. Dfine essentially removes noise from digital photographs. All digital cameras exhibit noise which can increase with higher ISO (sensitivity) settings. Noise usually displays itself as speckled colour and contrast effects, which in turn causes loss of clarity and detail. Dfine smooths out this noise without harming the original image quality. It is particularly useful for photographers shooting in low light environments where you may need to increase camera sensitivity. Viveza 2 is all about complex colour adjustments. Placing a control point on an area (see UPoint Technology above) allows you to edit the underlying colour with a set of sliders. 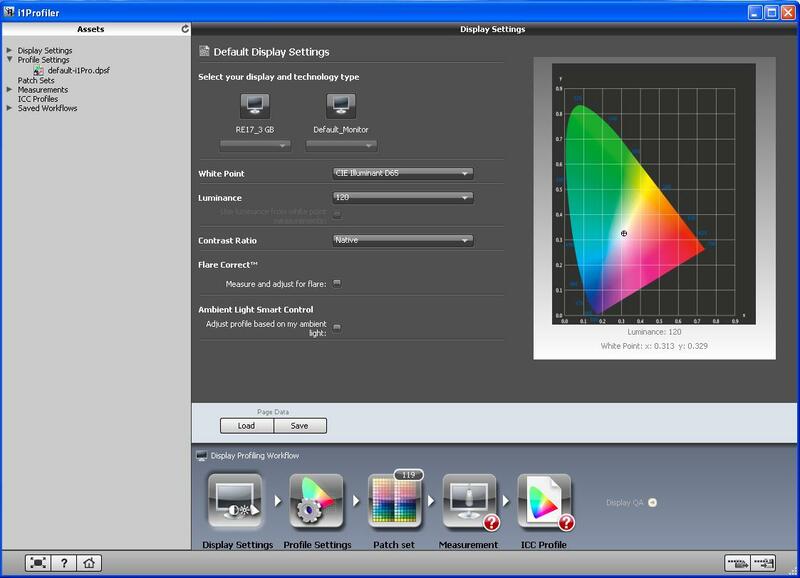 These sliders allow you to adjust the contrast, brightness, saturation and structure of that particular colour. The coverage of this effect and how far it spreads can also be controlled, allowing you to be really precise. In Photoshop, this can only be done with a combination of masks, selections and dodge.burn techniques. Viveza 2 is much simpler, and more accurate. Next week we look at Color Efex Pro 3 and HDR Efex Pro. This entry was posted in Photography, Software, Training and tagged Dfine 2.0, Image Editing, Nik, Nik Software, Viveza 2 on August 26, 2011 by colorconfidence. Last week we blogged about the types of colour referencing guides and formats available for you to use when referencing colour. This week, part 2 sees us look at the types of media these reference guides use, and how that may affect your choice of reference guide. Coated – This means the paper which the colours are printed on has a surface coating so that the inks sit nicely on the paper. This results in a vibrant, bold printed colour. Uncoated – A more ‘natural’ feel than coated media. It is easier to write on, but colours appear flatter due to the ink being absorbed by the paper. Newsprint & Recycled – This is a lower grade of paper which normally produces a ‘dirty’ or off-white colour. The paper itself has a high-level of ink absorbency producing dull, muted printed colour. As you can imagine, it depends on what the guide is required for. Generally, Coated guides are the most popular due to their vibrancy. However, Uncoated guides will probably give you a better reflection of what you can expect to be printed out. Newsprint/Recycled media will be best suited for newspaper adverts, which normally require CMYK 4-colour prints. The sort of print processes – or paper – you are using may also determine which colour reference guide to go for. So what printing processes are there? 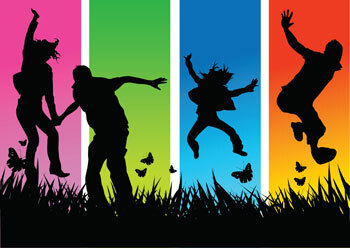 CMYK 4-Colour – A range of colours can be achieved through printing a combination of Cyan (C), Magenta (M), Yellow (Y) and Black (K) which combine and mix on the paper during the print process. 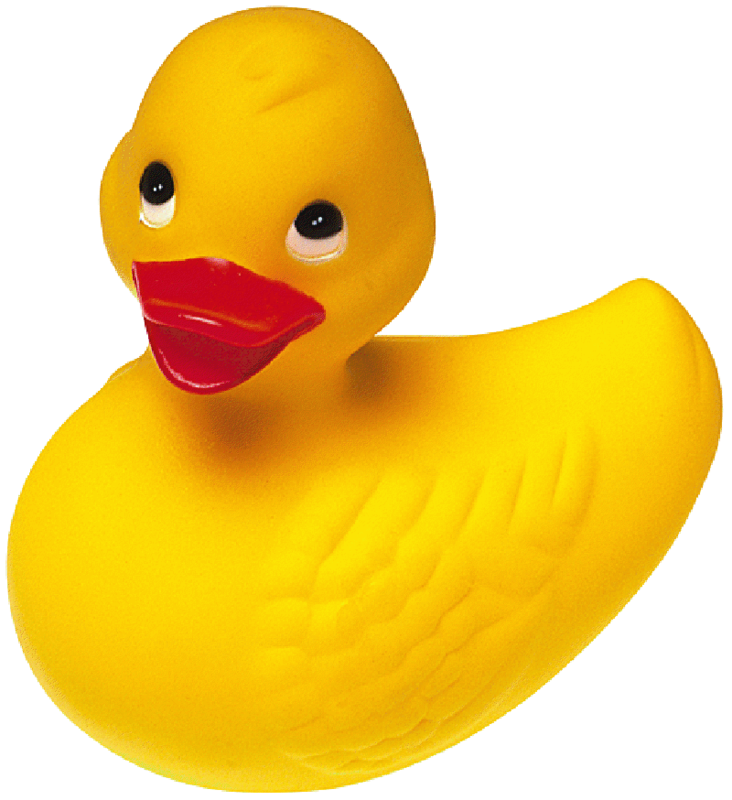 The resulting colours aren’t high on vibrancy, but the CMYK 4-colour process is required for the reproduction of photographic type images, or multiple flat areas of colour. 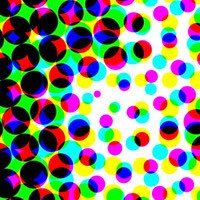 CMYK prints are made by printing a mixture of coloured dots which blur to produce the desired colour. Spot Colour Printing – In this method, inks are mixed to achieve specific colours before they are applied to the printing press. Mixing ‘recipes’ are provided for the print companies alongside each colour reference, in this case, found in Pantone Formula Guides. Specially made Pantone mixing scales are also available to help the mixing process. Spot printing produces a cleaner, more consistent image than CMYK. Textile, Plastic, Paint… – Unlike printing ink onto paper, colouring textiles, plastics and other materials have far more variables. For such processes, rather than colour recipes being created, manufacturers of the raw materials are certified for producing pre-colour specified materials. The final piece of the colour reference and print jigsaw is the visual assessment of colour afterwards. It is worth considering how the light and environment in which you review colours may affect how it looks. You can read about viewing conditions and how they affect what you see in our blog post, here. This entry was posted in Color Confidence, Printing, Training and tagged Color Confidence, Colour Management, Colour Reference, Pantone, Printing, Training on August 18, 2011 by colorconfidence. The next-generation i1 Profiler software included with the i1Display Pro should be loaded as your first step – do this before you plug the device into your machine via the USB port. If you use a Windows operating system, when you do plug the device in, the new Hardware Wizard will automatically launch and install the new drivers. Once this happened, launch the software. The software is incredibly intuitive, and the on-screen interface panel offers both text and video instructions, as well as ongoing prompts toward what you need to do next, if anything. 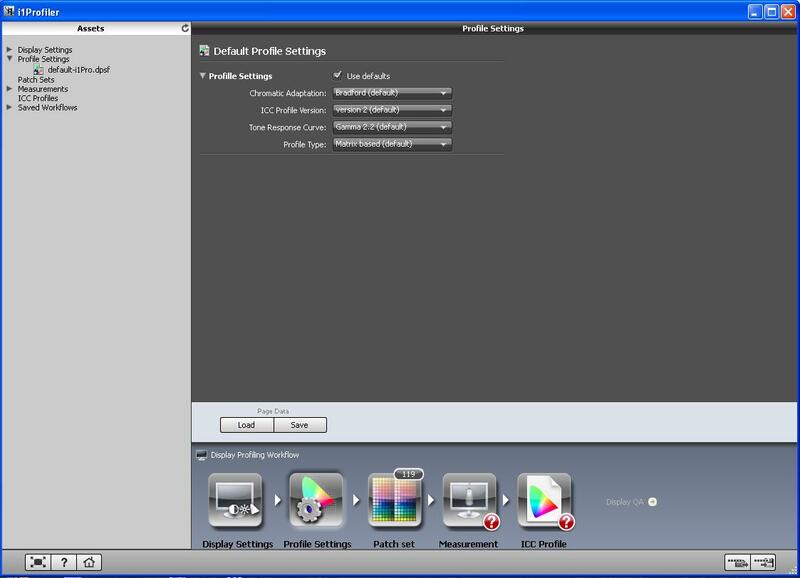 It is worth adding that the i1Profiler software is the same as that which is bundled with the X-Rite I1 Photo Pro & Publish Pro systems, so will offer you options for printer profiling on the interface – ignore this option if you do not own the latter devices. With the software installed, the on-screen interface will now ‘pop up’ and ask you a series of questions in terms of setting your calibration and further preferences. Now click on ‘Profile Settings’ to move to the next stage of the process. The i1 Profiler software utilises 119 colour patches to generate an accurate profile – you can also import additional colours if you wish. You would do this for colour specific project work. Additional colours can be loaded via the included PANTONE Color Manager Software, or via a loaded image – this opportunity is accessible via the clear icon above the patch sets that will be displayed on the user interface. 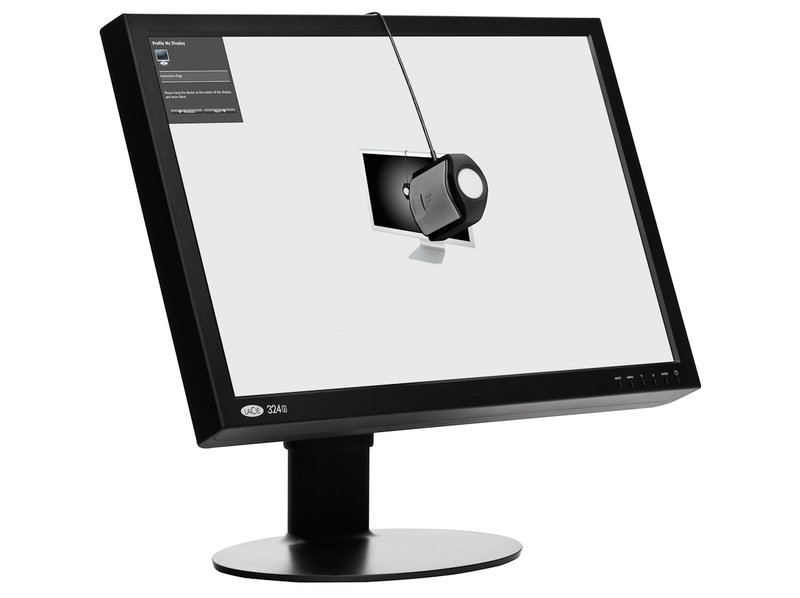 Ensure that the diffuser arm is over the i1 Display Pro’s lens and position the device roughly where you might position a paper print if you were comparing it to an image on the screen. Now click as prompted to start the ‘measuring process’. Your ICC Profile has been automatically created. Give it an appropriate name and save it. The software allows you to diarise the next calibration test and we would recommend that you set this for each calendar month to maintain consistent accuracy and for ongoing peace of mind. Your created profile will be displayed as a graph of the gamut on your on-screen interface. You can fine-tune this if you wish and click on the line of the graph to inspect the changes made in your monitor’s graphics card during the profiling process. You can also select the ‘image icon’ and see the direct effects of your calibration with a ‘before & after’ image. You can further click on the ‘arrow’ next to the ‘Display QA’ button, to access further tests to clarify the accuracy of your profile. The Patch Set type can be set to ‘standard’ to load one of the default sets and the software will then evaluate how accurate your monitor is against those patch references. 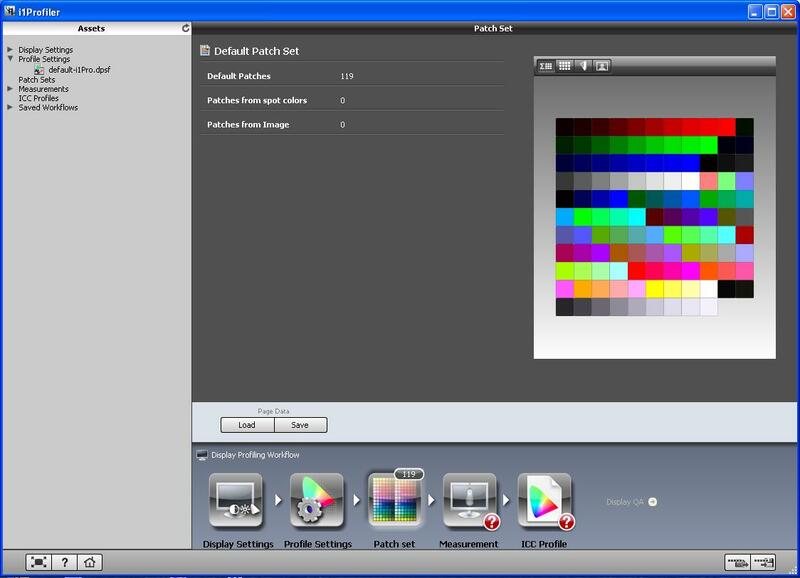 The patches from the ColorChecker, IT8 Charts and FOGRA Media Wedge are also accessible for optimum referencing. You can also load Spot Color testing charts via the PANTONE Color Manager Software or by uploading your own images and extracting colour test values from them. When measurement is complete, a summary of results will be displayed on-screen. Generally, you should be aiming to achieve Delta E of less than 2 and a maximum of less than 4. This is of course only a rough guide, and you will want to achieve values specific to you project needs. These reports can all be saved and will contribute to the ‘trending data’ which evolves over time. A ‘trending graph’ can be displayed by selecting it on the interface and provides a very useful guide to how your monitor alters over time. The i1Profiler software also offers a module for checking monitor uniformity, which is a useful additional assessment tool. This entry was posted in Calibration, Monitor Calibration, The technical stuff, Training, X-Rite and tagged Help, i1 Display Pro, Training, X-Rite on July 13, 2011 by colorconfidence. I mentioned last week that we’re now offering great training opportunities. Well, I’m pleased to report that we have our first course offering three bite-sized modules! 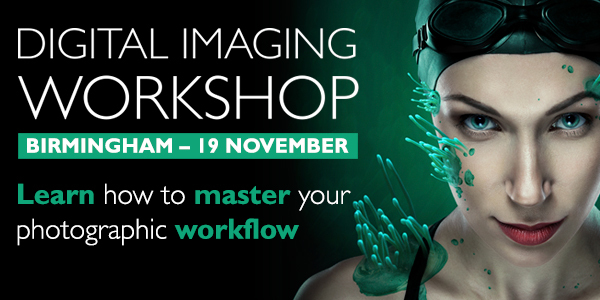 Topics will cover an introduction to the key areas of colour management and digital imaging – with the intention of sharpening your skills and helping you gain a better understanding. Light & Shade – Ever wondered how can you create the optimum physical environment to capture that perfect image, or whether you can accurately match what you see on-screen to what you print? Both answers will probably involve a consistent light source, or perhaps something like a PChOOD addition to correctly configure your monitor. Profiles and Colour – We’ll overview the basics of this important subject – specifically, just what is a ‘profile’ exactly? How should you use them? What is the difference between sRGB and Adobe RGB – and when should you use them? Training takes place at our Spectrum Point HQ in Birmingham. Attendees will also have the chance to participate in practical demonstrations of the advantages of working in RAW workflow and using the award-winning ColorMunki. If you’re interested, click here for more information. We’re looking to do more of these sessions too, so if there’s anything you’d like us to cover, please let us know or comment below! This entry was posted in Colour Management, Consultancy, Monitors, Photography, Profiling, Training and tagged Color Confidence, Colour Management, Consultancy, Light & Shade, Monitor, Photography, Profiling, Training on October 19, 2010 by colorconfidence.